At Tachibana Shikitei, we would like to cherish your personal information more than anything else. 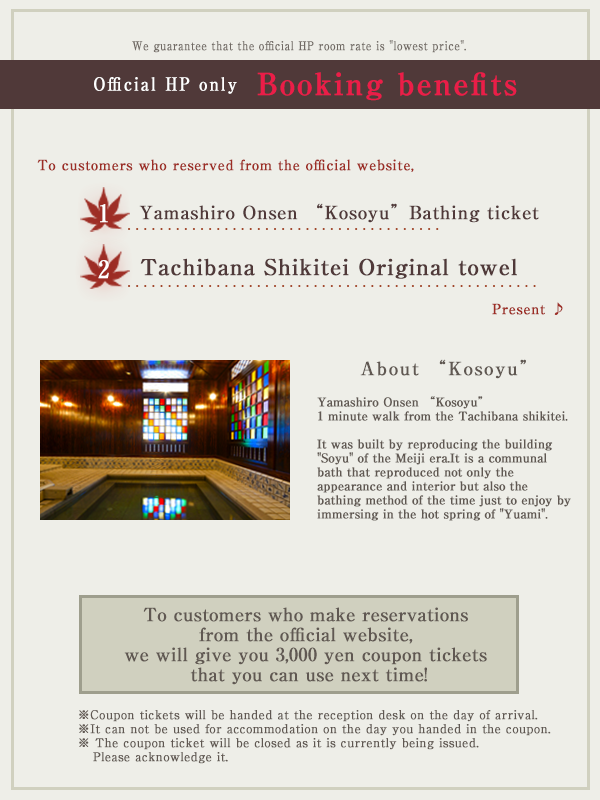 Regarding the handling of personal information on our homepage and this website, please have you read the following and agree before making a reservation. １、We stipulate provisions concerning protection of personal information, thoroughly enforce all employees, and continuously review this and make efforts to improve it. ２、We make the purpose clear on collecting the personal information and perform the use, an offer within the purpose and the use and the offer to a third party against a purpose amount and do not disclose it. ３、We manage the personal information precisely and take safety measures against unjust access to personal information, loss of the personal information, destruction, manipulation and a leak and carry out the prevention and a corrective action. ４、We observe laws and ordinances about the personal information and other models. We handle personal information in the following duties from customer. About outsourcing of personal information. In order to carry out the above work, we entrust part of the work to the outside, We may delegate your personal information to the extent necessary, but in that case we will oblige you to manage properly by contract. For inquiries about personal information, please do the following.